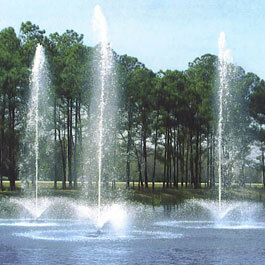 Pod-Jet Floating Fountains are popular options for lakes and reservoirs. They provide a dynamic element to still bodies of water. Pod-Jet Fountains produce well-defined, vertical columns of frothy water. They provide a dynamic element to still bodies of water. Pod Jet Fountains are similar to Floating Geyser Fountains but are more linear in nature than the geysers. The columns are very resilient to heavy winds. The display features are created by a grouping of smooth bore nozzles or aerating foam jet nozzles. The column can reach heights from 20- to 40- feet in the air. 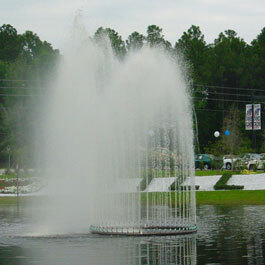 Delta Fountains’ floats are made of fiberglass and often house waterproof fountain lights to illuminate the column. 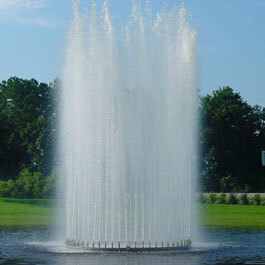 A Pod-Jet may be a stand-alone display or paired with an outer ring of nozzles to create Multi-Jet Floating Fountains. Floating fountains, like the Pod-Jet style, are great focal points for lakes and reservoirs. 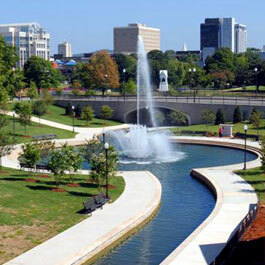 They’re popular in commercial and residential sectors, higher education campuses, and golf course landscape design. Aside from the acoustic benefits they bring to the surrounding area, floating fountains also bring an important aesthetic benefit. During the day, the columns draw visitors’ attention to the water. At night, an illuminated fountain will not only provide light to the column of water but also the surrounding water’s surface. Man-made lakes and reservoirs are often subject to still water, especially in areas with little wind activity. Floating fountains offer aeration and surface disruption that bodies of water need to keep from getting stagnant. 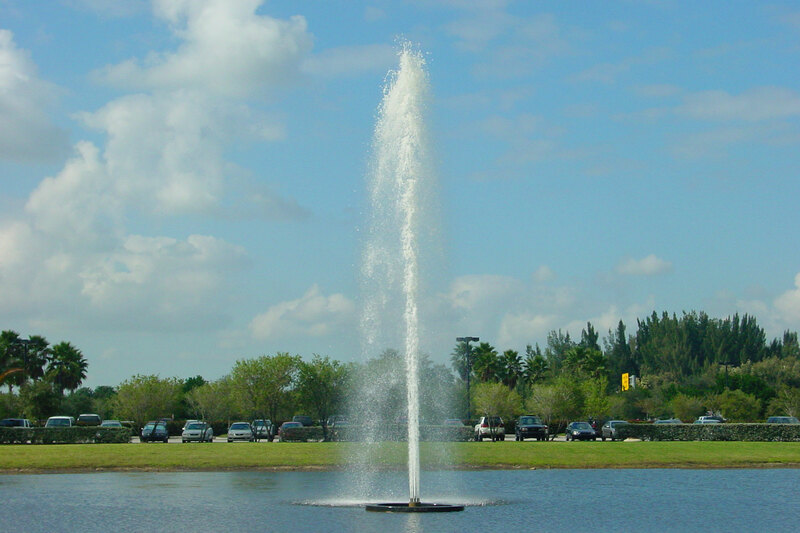 Having a floating fountain reduces algae levels, increase oxygen levels and provide a large percentage of the required aquatic maintenance. These are all vital to the health of water bodies, especially in mosquito-prone areas.